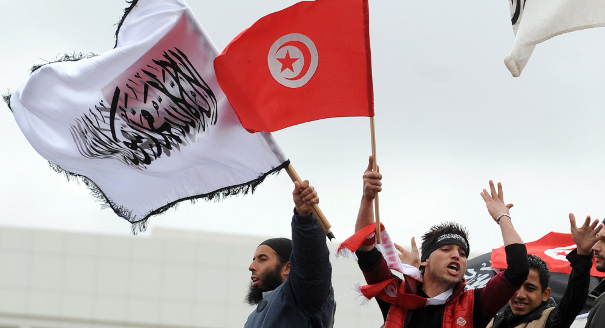 Have Tunisian Salafists written themselves out of the new constitution? Tunisian Salafists demonstrated this weekend on Avenue Habib Bourguiba in central Tunis. Thousands of supporters rallied for the Quran, for the institution of Charia law, and to show Tunisians that they would not back down. But the image that will remain for most Tunisians is one of a half dozen Salafists scaling the clocktower in front of the Ministry of the Interior and waving their black flags with the shahada. See above photo courtesy of Tunisia Live. The government, led by moderate Islamist movement Ennahdha, has been walking a tightrope with Salafist groups. The Interior Minister told Le Monde last week that jihadist groups were the number one danger for Tunisia, but he was also careful to distinguish between Salafist groups and jihadist ones. Ennahdha leaders have told me that their goal is to not push these groups underground, but to neutralize them by allowing them to protest. Nevertheless, Ennahdha seems to be feeling the pressure from ordinary Tunisians, who group both violent and non-violent fundamentalist groups as extremist. This might partly explain Ennahdha’s announcement today that it will leave the first article of the constitution as is. Article 1 has been the subject of debate, particularly for those who argue that it should include charia as the principle source of legislation. The debate over charia is far from over. However, it appears that the more the Salafist are in the news, especially when they are allowed to deface public buildings, the less popular they become. The question is whether or not the public will continue to support Ennahdha’s “light touch” when it comes to these groups – or whether it will force Ennahdha to track further toward the center.